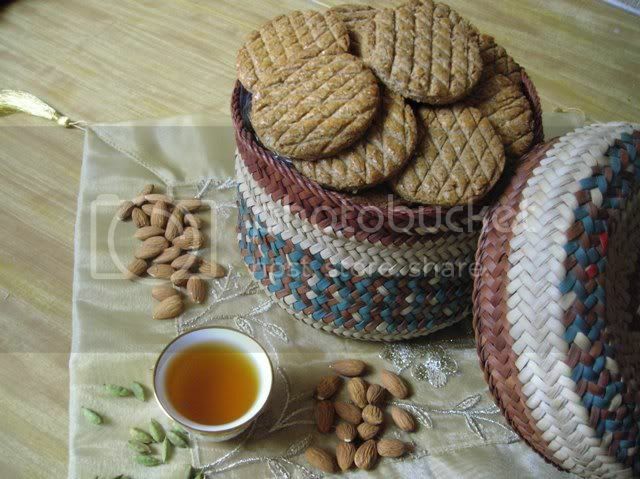 Klejah originally came from Iraq ,and we eat it alot in arabic gulf area specially in Saudi Arabia and Kuwait. 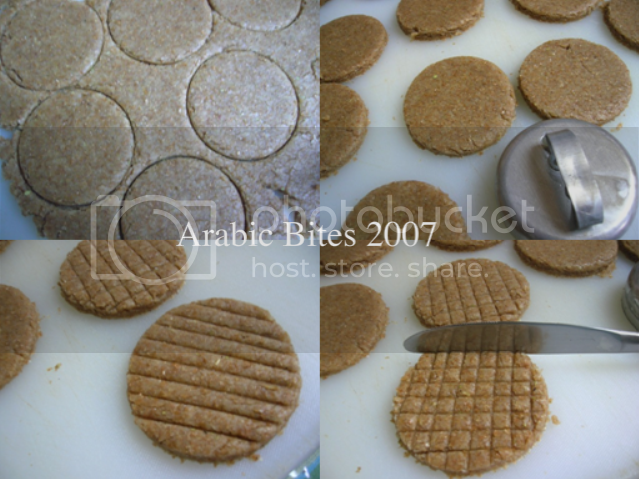 Serve with arabic gulf area coffee or cardamom tea. 3 cups whole wheat flour. 1/2 cup + 2 tablespoon corn oil or sunflower oil. 1/4 cup low fat milk. Egg + 2 tablespoon milk . 1)Combine sugar and milk in small pan ,stir over heat without boiling ,until sugar dissolves, set a side, let it cool. 2)Sift flour into a mixing bowl , add the oil into the flour & combine with a fork or your hand until crumbly , then add other dry ingredients, egg, sugar and milk, mix well (Form dough into a ball )let set for 10 to 15 minutes. 3)Roll dough, cut it with biscuits cuter, then make a cross lines using back of knife. 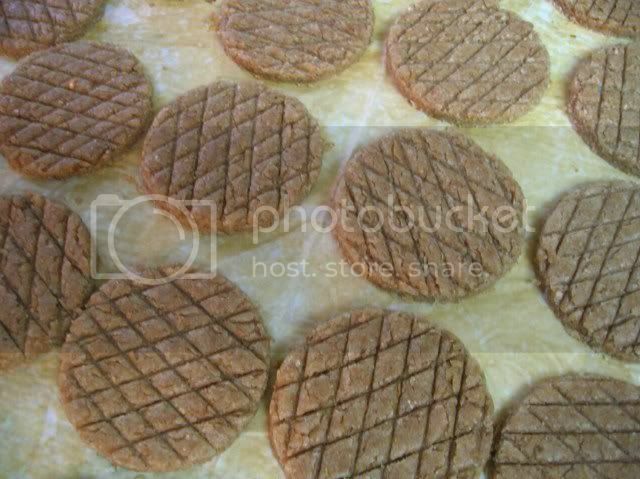 4)Place it on baking sheet, brush it with egg wash, bake in 350 F oven for 15-20 minutes, or until golden brown. The basket is exquisite! 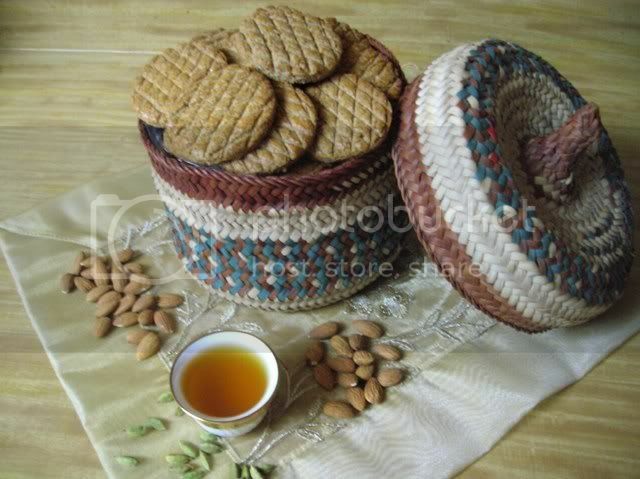 In Southern Algeria they keep dates in such baskets. I really do love them! Oh these look fabulous! They look like they'd go great after a big plate of Lubnee and rice! Those biscuits will be a perfect addition to my break the fast in a couple of weeks. Before the begin of our 25 hour fast we tell each other to have an easy fast. I hope that your month long fast is an easy one. These look amazing =) I'll try to make them tomorrow. I bought a bag of cardamom pods and I don't know many recipes that use it..i guess your blog will be very helpful to me! Thanks! my dough didn't turn out all smooth...especially when i was rolling the dough it was getting flaky and breaking apart...? any clue why its happening? If your dough didn't turn out all smooth. 1)Make sure you dissolves the sugar in milk first. 2)Also it's depends on the type of flour you used,so if the dough get flaky and breaking apart add more milk untill the dough get smooth. Your klejah looks delicious, Thanks for sharing this iraquian recipe. Can I substitue oil with butter? If so, how much? Great recipe!